Sue Dibny, the wife of superhero Elongated Man, is murdered in their apartment, apparently dying of burns (the Elongated Man was at the time on a stakeout, during which a minor character called Bolt is shot and wounded by criminals). The DC superhero community rallies to find the murderer, with villain Doctor Light being the prime suspect. Green Arrow reveals to the Flash (Wally West) and Green Lantern (Kyle Rayner) that Light once raped Sue Dibny in the JLA satellite headquarters. 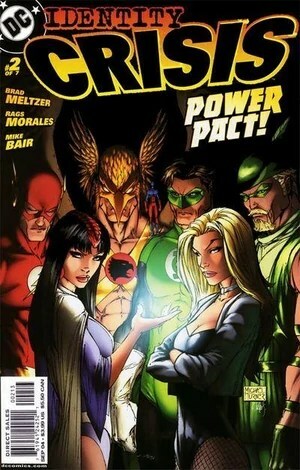 To ensure this could not happen again, League members at that time — Atom (Ray Palmer), Black Canary, Hawkman, Green Lantern (Hal Jordan), and a very reluctant Flash (Barry Allen) — allowed the sorceress Zatanna to mind-wipe the villain and alter his personality. 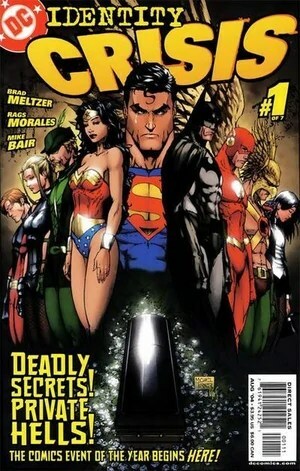 Further discussion reveals that a mind wipe was also done on at least one other occasion: When the Secret Society of Super Villains (the Wizard, Floronic Man, Star Sapphire, Reverse-Flash, and Blockbuster) captures JLA members Superman, Batman, Flash, Green Lantern (Hal Jordan), Zatanna and Black Canary (pre-Crisis it was Wonder Woman rather than the Canary) and switched bodies with the heroes, allowing the villains to learn their secret identities by casually removing the heroes’ masks. 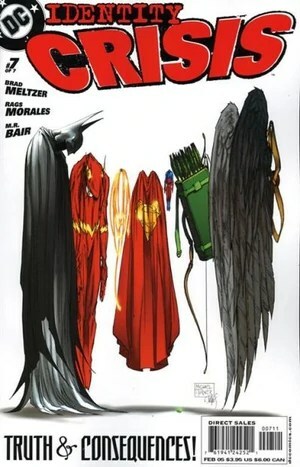 Although the heroes defeated the villains, Zatanna once again erased the villains’ memories of the incident and their knowledge of the secret identities (Green Arrow’s words imply that they have done this on other occasions when their secret identities were threatened by magic or other means). 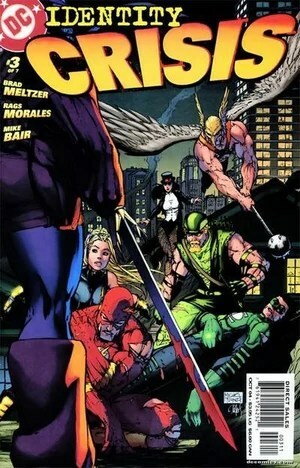 The heroes locate Light, who has hired the mercenary Deathstroke to protect him. During the battle, Light regains his memory and, enraged by the violation, uses his formerly lost powers to escape. Although questioned by Superman, Wally West continues to protect the heroes and their secret. Atom finds his ex-wife, Jean Loring, hanging from a door, bound, blindfolded and gagged, and revives her just in time. 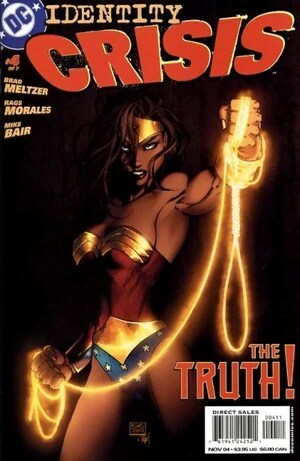 A death threat is then sent to Superman’s wife, Lois Lane. Flash Rogues gallery villain Captain Boomerang (Digger Harkness) is hired by third-rate villain the Calculator (on behalf of the real killer) to assassinate Jack Drake, father of Robin, Tim Drake. Jack finds a gun and a note warning him of the impending attempt on his life, and fatally shoots Boomerang who also kills him. 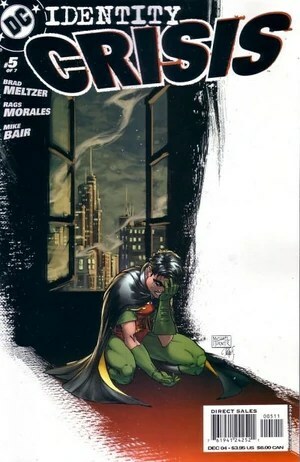 Tim Drake witnesses this and is comforted by partner Batman, who confiscates the note before the authorities or the media can learn of its existence. Wally West questions Green Arrow again after accidentally seeing a snapshot of the battle on the Satellite in Light’s mind, which reveals that Batman was also present. Green Arrow confesses that Batman disapproved of the attempted mind-wipe and also had his memory of the incident removed. Batman uses his detective skills to find the hideout of the Calculator, but discovers the villain anticipated this and abandoned it. 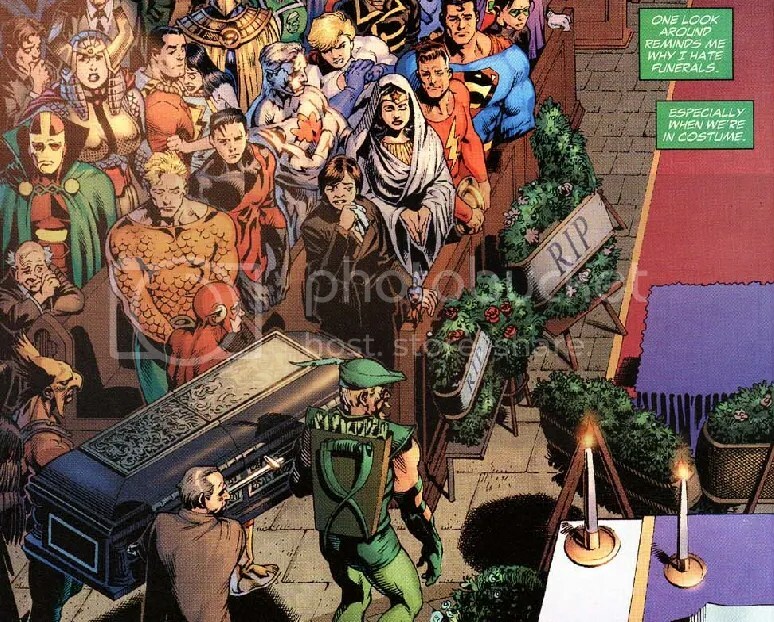 Theautopsy of Sue Dibny’s body by Doctor Mid-Nite and Mister Terrific, members of the Justice Society, reveals Dibny was killed by an infarction in her brain. A microscopic scan of Dibny’s brain reveals tiny footprints as a clue to the cause of the infarction. Doctor Mid-Nite and Mister Terrific realize, as does Batman in the course of his own investigation, that Dibny was murdered by an assassin with access to the shrinking technology of the Atom (the technology allows the ability to shrink to subatomic size). Almost simultaneously, Palmer learns that his estranged wife, Jean Loring, is aware of the note sent to Jack Drake (which had been kept secret) and deduces she is the killer. Loring claims she did not mean to kill Sue, and it was not her intention for Jack Drake to be killed, arguing that she sent the note and gun so he could protect himself. Loring states that she undertook the plan (including faking the attempt on her own life) in order to bring Ray back into her life. Palmer says that she is insane, and Loring is committed to Arkham Asylum and kept under heavy medication. In the final scene with the Justice League, Wally West is awkward in the presence of Batman, who is suspicious of his behavior. 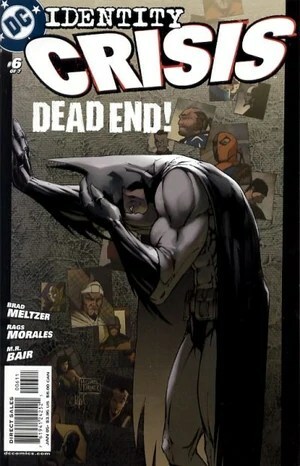 The ramifications of this story are depicted in the title The Flash, as the hero’s Rogues band together at the funeral of Boomerang, a one-shot Countdown to Infinite Crisis, as well as one of its tie-ins, The OMAC Project, and the title JLA, which reveals that Batman remembered the events in question at some point after. 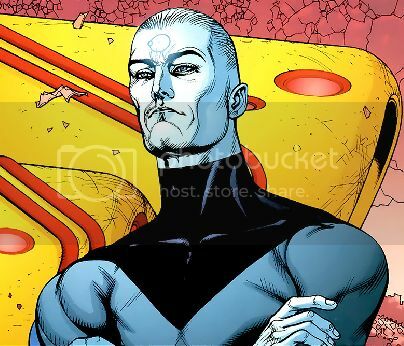 Batman’s suspicions lead him to create the Brother MK I satellite to monitor superhumans, which is an important factor in the subsequent crossover storyline Infinite Crisis.